I cant believe that Sophia has now been at school for a whole year, its not long until she will break up for the summer holidays and her year in Reception will be long behind her. Reception is mostly play based, she doesn’t have homework apart from doing reading at home with Mr T and I and it is quite relaxed and I like it like that. There is not much pressure on her and it has helped her settle so well because school is somewhere that she thoroughly enjoys. When George at Asda got in touch in regards to their #backtoschool campaign I jumped at the chance to get involved. I have to start by saying how very proud I am of Sophia! She has done so well, her first year has been so positive for her, she has come away with so much. That goes with thanks to her lovely year R teacher and the teaching assistants for making her feel so welcomed and helping her along her way. We have yet to have the last parents evening of the year which I am really looking forward to. The first year of school for Sophia has definitely given her so much confidence. I have seen her blossom right before my eyes. There have been a few hiccups along the way which I did write about and which were resolved. But hard to go through all the same. Starting school can be tough especially if you are sensitive and that my Sophia is. However I was hoping going to school would help boost her confidence. I just want for her to have the confidence in herself, enough to stick up for herself, say what is on her mind and be able to answer questions without feeling shy. I am sure her teacher will have lots to tell me at parents evening and I look forward to it. I think now that the year is coming to an end she has definitely achieved that. She has grown in confidence and self assurance. She still has some moments but she is learning to tell herself she can and that she is able to do anything she puts her mind to. This year also saw her have her tonsils and adenoids removed. Since her procedure in May she has come on leaps and bounds and in many ways and is like a different child altogether. I wouldn’t change this year for the world even though some days she has not wanted to go to school some days she has been sad but I can honestly say that her class teacher has made an enormous effort to boost her confidence and she really has her best interests at heart which makes me happy. Sophia is enjoying the warmer weather and prefers wearing white socks to school with either a skirt and shirt or a summer dress. 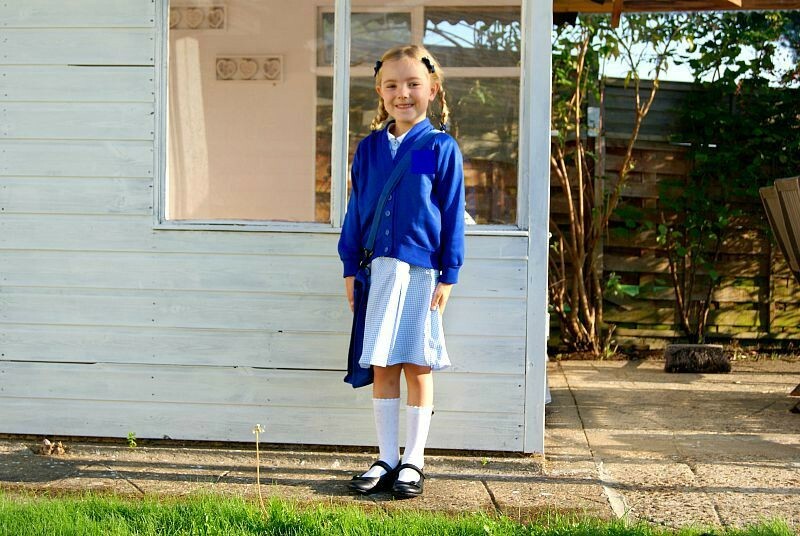 She received a lovely school dress from George at Asda and two beautiful white shirts. I love them because they have a curved collar and detailing on the front. Sophia loves this too. It makes a nice change for the usual collared unisex shirts. She is very impressed with her bits from George at Asda. She also has sports day coming up soon and I am looking so forward to it as I missed last year due to being at a blogging conference. I have ordered her two yellow polo shirts for her for sports day. Her team is called Frank and their team colour is yellow. Sophia’s first year has been everything I hoped for her and more. She has settled in well and learnt lots. She most enjoys exploring for mini beasts in the school forest, and playing outside with her friends. Did you make any friends on your first day? What were their names? My next door neighbour was my friend before we started school her name is Maja. I am also friends with Maisie. Do you still keep in touch with anyone you met on your first day? Yes Maja and Maisie, and Maja is my next door neighbour. Who was your best friend in Primary school? Maja is my best friend in Primary School and she lives next door to me. Did you take a packed lunch with you on your first day? I have school dinners but sometimes mummy does me ham sandwich for packed lunch. You can read the post I wrote on Sophia’s first day here. You can read the post I wrote on Sophia’s first week of school here. We were also featured on the George at Asda website discussing school through the generations. * We are currently working with George at Asda on this campaign. Ah my eldest starts full time school in September, I am so nervous. I love George’s clothing. What a great campaign to be a part of. We love Asda’s school uniforms. My daughter starts school in September and she can’t wait! I love the questions you’ve asked your daughter. I think I will do something similar. Ah she looks so sweet in her school uniform. My twin girls are starting junior school in September and that will be such a big step up for them.